Forwards received and sent SMS messages along with the sender/receiver address and time of the SMS to a specified email address. Emails are sent directly from the user’s phone to the user’s email account. 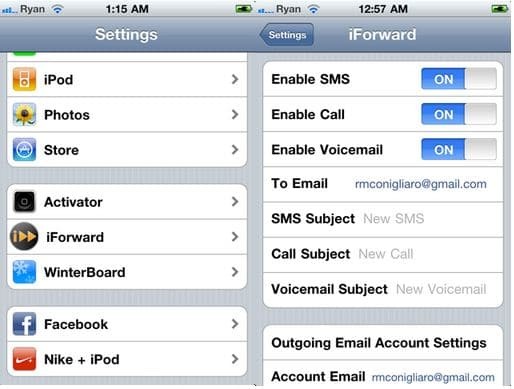 Sends a notification of received calls and calls made to a specified email address. The email includes the time of the call and the sender/receiver address. Sends a notification of received voicemails to a specified email address including the sender’s address and the time of the message. Includes voicemail audio file as an attachment in the new voicemail notification email. Supports sending information encrypted via SSL for data privacy. Good for keeping track of your phone in case it gets in the wrong hands. Good for setting up alerts on your email account when getting a new call, SMS or voicemail. This application is great if you are worried that somebody is using your iPhone to send text message when you leave it in your house or somewhere. Or you could use it for evil and spy your girlfriend or boyfriend, who knows. If you decide that you want to buy this app to spy on your boyfriend/girlfriend, you’ll first need a jailbroken iPhone on iOS 4 or iOS 5. Then you can find the app on Cydia default repo BigBoss for a price of $1.99.